Techne® invented the "Clip On" thermoregulator in 1948, and now offer four units. Thermoregulators are designed to be used with the Techne® unheated water baths or any other suitable laboratory vessels. They will heat, circulate and safely control the temperature of the liquid in the bath within precise limits. • Please note for sub-ambient cooling a Dip Cooler or Flow Cooler is required. Click here. • Applications <0°C and >100°C require Techne bath oil. Click here. This thermoregulator can be used for sub-ambient cooling, right down to -40°C, although a low-temperature liquid is required below 0°C. Sub-ambient cooling can be achieved using the cooling coil accessory (part number FCC01) connected to an external chilling system, for example a cold tap. Alternatively a Techne dip-cooler or flow cooler could be used as a method of chilling. 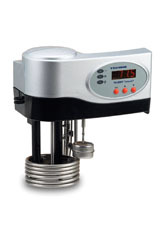 This thermoregulator is a stand-alone waterbath temperature controller with precision accuracy and stirring action. It can not pump hot or cold liquid to an external system or device. This application requires model TE-10A, TE-10D or TU-20D.